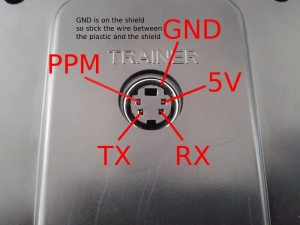 I need HELP connecting 2 new TX6i for buddy box training. I recently purchased 2 of the latest TX6i international transmitters to setup a buddy training system. Great little deals. I bound the TRAINER (master), set it up as trainer using switch 8 (momentary). It displays ACTIVE or INACTIVE as I flip switch 8. I programmed (no binding) a 2nd TX6i as the STUDENT(slave) and it shows an "S" on the main screen. FYI it also looks like the slave TX must be powered ON to keep it in the STUDENT mode. A straight through 4 pin video cable connecting the master to the slave does NOT work. My next option would be to rewire a cable so that the PPM output would be rewired to the PPM input on one or both of the connections. I cannot find an accurate pin-out diagram to insure I don't crossover pin-out output voltage to ground by mistake and not the ppm in/out. This works for a Computer cable I guess you just connect the two PPM's together.